Find Issue #164 (Fall 2014), “Community Conversations,” of Communities Magazine here! While helping communitarians measure their progress toward sustainability goals, a college student finds herself unexpectedly changed. “Wouldn’t it be great to buy a block of land together in the bush?” Dinner party conversations yield unexpected fruit. When they crave an especially deep or challenging discussion, Gesundheit!’s meta-conversers excuse themselves (from the mundane)—then stir the collective pot, lie down, or go for a walk. 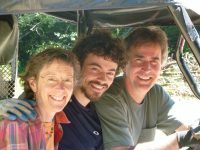 A small communal family discusses how they got good at cooperating, and other essentials of collective life. 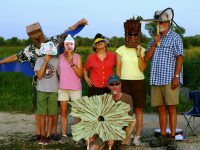 After 11 years of gathering, a group of Kaw Valley’s cosmic explorers realizes that community has happened to them. 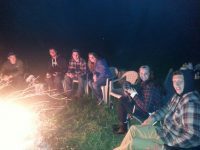 For intentional community members, community comes with added benefits, unique challenges, and a call to authenticity. 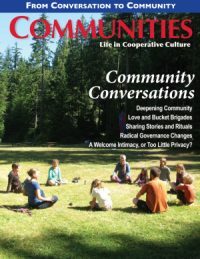 In our “Community Conversations” issue, people both within and outside of intentional community discuss questions like: What does community mean to us? Where do we find it? What are its benefits and challenges? How do we deepen our experience of it? What is the purpose of community, and how do we talk about it? Their stories form a rich, diverse tapestry in which community and conversation prove to be inextricably intertwined. Community grows when we make time to share our stories, enjoy one another, take care of one another, and work on building a better world together. In an age when prioritizing community is itself radical, self-awareness, self-care, and storytelling are essential to deepening our connections.